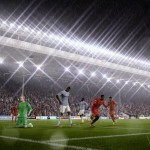 With E3 now history, we continue to focus on what has been newly announced about FIFA 15. 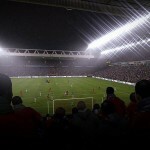 Today we look at “Living Pitch” where stadiums are alive and full of the emotion that only football can create. Playing surfaces wear down as the match progresses, with boot marks, slide tackles, and debris visible on the pitch. Corner flags move, goal frames shake, and animated LED ad boards bring FIFA 15 to life.. Watch the video and learn more here. In FIFA 15, boots will leave their mark. Playing surfaces wear down over time and reflect the battle on the pitch. Footprints, debris and slide tackles will all be visible. Goal frames shake with awesome strikes. Animated LED boards give an even deeper level of realism to matches. 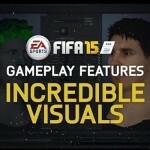 Check out more images at EA SPORTS FIFA 15 Living Pitch article.